crawling through tunnels as well as tactile play with multiple sensory modalities. The class ends with calming down and a short relaxation to get them ready to finish their day. 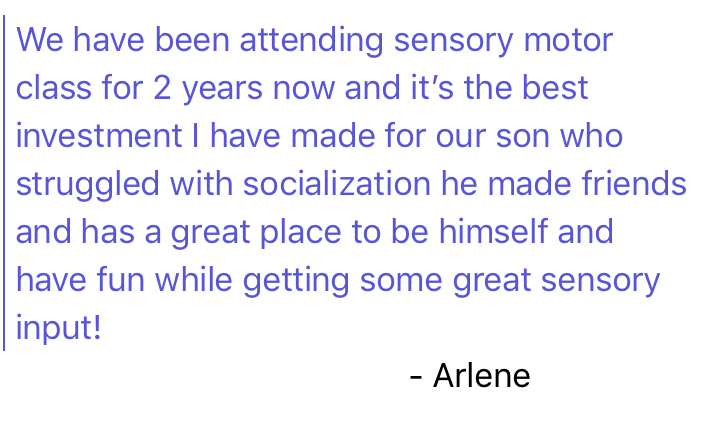 This Mommy and Me group uses a language, curriculum, and multi-sensory based approach to learning while promoting play, socialization and gross motor activities. Help foster your child’s confidence, communication, and play skills through exploration and socialization. The group gets to explore table top activities, obstacle courses, books, songs and arts and crafts. Let your budding artist do what they love. The kids love painting themed based projects led by our art instructor. Lessons for My Daughter founded by Carmin Caterina is joining us for a workshop for tweens and teens exclusively! The workshop is designed to empower young women to feel more confident, increase self esteem, and feel more connected to themselves, others and the world around them! Register at Lessons for My Daughters website. Children get to experience the joys of yoga through music and play while improving balance and coordination. Yoga will improve your child's self-awareness while calming the body and mind to allow new movement experiences. Are you finding that your child is having difficulty communicating with peers due to social language challenges? Get in shape and use cardio equipment in a small group, therapist supervised setting. Build strength using resistance exercises with weights tailored to individual needs. Perfect pre- teen and teens not ready for the open gym environment! Have other classes that you would like to see? Contact us and let us know!